“Hello my name is Ramona, I just received my order of 3 DVDs from you and wanted to share my story. “I've been doing a simplified chair yoga for over two years. I rationalized that it was OK because it was so modified and there was no meditation ever taught in the class. I never felt comfortable placing my hands in the yoga position or reciting the closing words and left my hands open as to praise God and said ‘God Bless You' quietly. “Recently I have felt a slight void between the Lord and me, so I started praying about it. I feel the Lord allowed me to experience some very strange spiritual warfare. At night I was troubled by bad dreams of evil spirits screaming and harassing me. One night I recalled that 30 years ago I took one yoga class and as I did the cobra position I felt a slithery snake feeling come over me. It scared me so much a left the class immediately, never to return. “The Lord showed me it was the yoga keeping me from Him….. I felt ashamed, grieved, and even sad as I renounced this activity and again did not return to this second class. “I continued to pray and almost returned to the class because it felt so good to stretch after a hard workout. “I was then led to perform a Google search and read about the history and the meaning of the yoga positions. I deliberately looked to secular sites first to read their teachings and then the Christian views on the practice of yoga, what an eye opener! “I found your website and carefully read and watch the video clips. Several days later I decided to place an order a bit cautiously hoping I would be OK with this product. 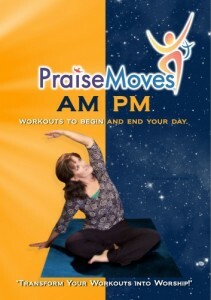 I just watched the AM-PM PraiseMoves DVD and had tears in my eyes!!!!!! “Thank you for the time, money and most important the prayer that you've invested in this project.